I take pride in producing knives that are strong, sharp and, thanks to the pattern-welded (or “Damascus”) technique I use, beautiful to behold. Each blade is a melding of several types of steel, bearing its own uniquely mottled fingerprint. I occasionally make mono steel blades from high carbon steel that’s been re-purposed from old chisels etc, for those interested in a good quality blade with a greener recycled pedigree. I don’t use ‘stabilised’ timbers as I prefer the feel of natural timber and to source the material for handles as ethically as possible. Handle materials are all either natural sustainable UK timber or, if I use exotic hardwoods, they are chance finds of old furniture or tools that I’ve re-purposed. I have also used other natural substances such as antler. All my knife blades and handles are coated with a light food grade oil. Damascus Steel has been manufactured for over a thousand years, taking its name from Syria’s capital city, where the finest blades were sold. 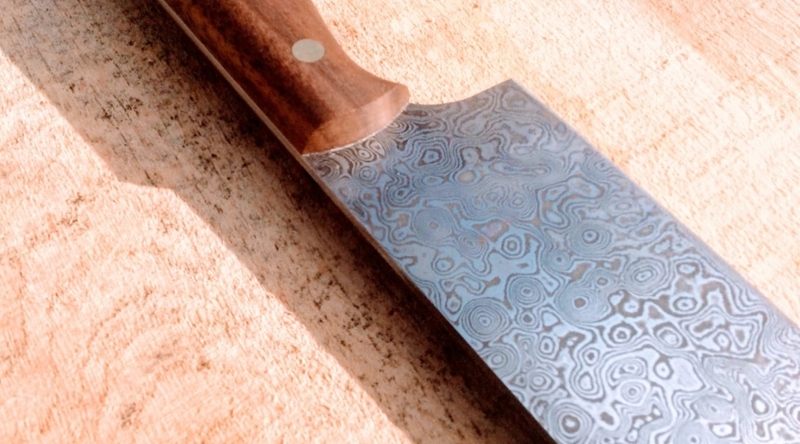 Damascus steel is the stuff of legend in blacksmithing. The process, which broadly involves forging two or more types of steel alloy together in multiple layers, is believed to originate in Middle Age Middle-Eastern swordmaking. 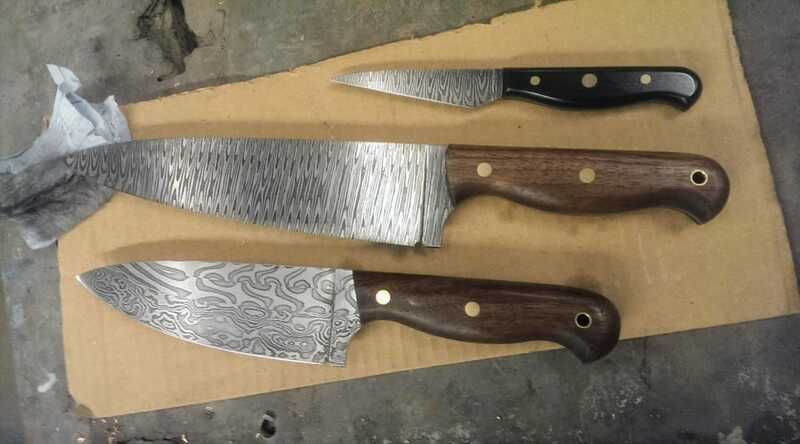 It was all but lost to blacksmiths around the 17th century and only properly resurfaced when pioneering American knifemaker William F Moran unveiled a Damascus steel set in 1972, along with a booklet on how to make them. 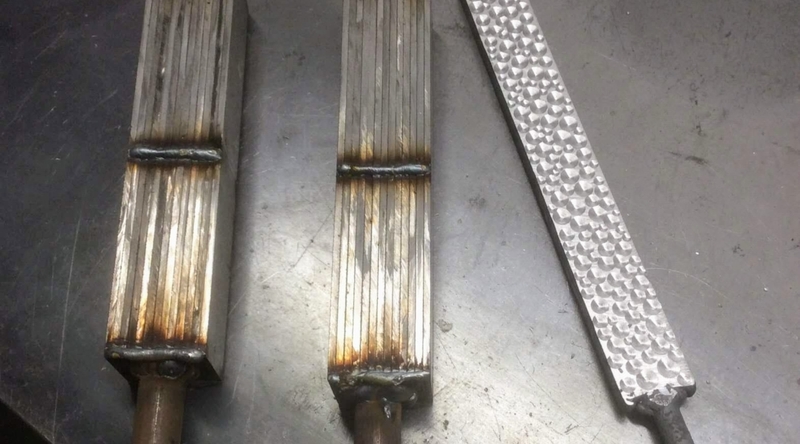 To make my blades, I begin by ‘fire welding’ a sandwich of alternate layers of two slightly dissimilar carbon steels, called a ‘billet’. I then create patterns by twisting, punching, or otherwise manipulating the billet. Finer patterns can be created by cutting and restacking the original billet to increase the numbers of layers. Each combination of techniques will create its own unique pattern. Next, I forge the billet close to the finished size and shape, and then grind it closer still. To ‘normalise’ the stresses within the steel created during the forging process, I heat the blade to a point where it becomes non-magnetic and allow it to cool in still air. This process is repeated a further two times. I then heat the blade back to the same temperature and quench it in oil, leaving the blade almost as hard as diamond, but as brittle as glass. hardness needed to grind the blade to a perfect edge. After which I carefully grind it to the finished size and shape, in order to not create too much heat thereby destroying the temper of the blade. Finally, I etch the blade in a ferric chloride solution, which acts at a different rate on the two grades of steel, thus revealing the patterns created during the forging process. I make and finish the handles from a selection of natural materials such as wood, horn and antler. After fitting the handles, I hone and strop the blade to a point where I can shave the hairs on my arm. Finally, the blade and handle are given a light coating of food grade oil to protect it. The whole process is very labour intensive, taking anything upwards of 20 hours, depending on the complexity of the design.